I don’t watch “The Bachelor” on TV so I would not have known about this if not for some impressive internet sleuthing on the part of Montana Fly Company’s Facebook page. 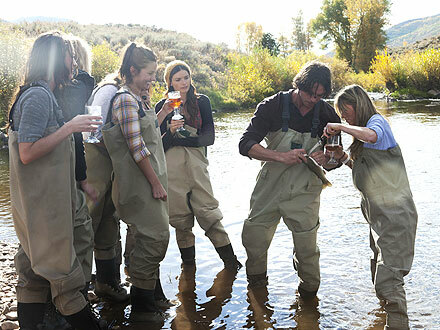 Apparently Ben Flajnik (the guy who is The Bachelor) grew up in a fishing family so he took his harem to a lake near Park City, Utah for a group date and they did a bit of angling. You can read the riveting story here if so inclined. I suppose there are worse places The Bachelor could have taken his gaggle of gals. But as much as I approve of fly fishing as a wholesome activity for anyone, there’s something wrong with this picture: Where are their wading belts?! Not only is it unsafe to be wading perilous waters without their belts, but wading belts offer a slimming effect. And I believe PBR in cans would have been more appropriate than whatever they’re drinking out of their fancy glasses, not to mention that glass is to be discouraged when fishing. Glassware, that is- not glass fly rods. I don’t want to get in trouble with Cameron Mortenson over at the Fiberglass Manifesto.